You might think I'm mad but...: I roll[ed] out of bed in the morning and [threw] on what I wanted and [went]. I roll[ed] out of bed in the morning and [threw] on what I wanted and [went]. At 4.20am your alarm clock goes off, quickly followed by several other persistent alarms from your mobile. Groaning, you drag yourself out of bed onto the stone-cold floor as the bright fluorescent lights from the convenience store opposite softly permeate the room. Stumbling around you are incredibly glad that you planned your outfit AND set out your clothes for this morning. Once dressed, you double check the contents of your backpack: flight reservations, passport, change of clothes? All ready!You head out the door to the stillness of the night: you have finally found a quiet hour in 조치원. On the 2nd November, this was me as I made my way from 조치원 to Seoul and then Osaka, Japan. Fantastic poses! Photos courtesy of Katetastic. A link to her blog is at the bottom of this page. 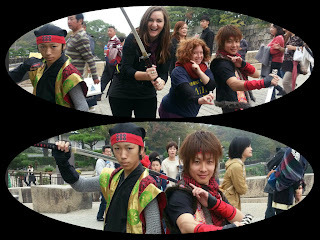 A few weeks ago, Katetastic and I were talking about how close Korea is to some other countries like Japan and Taiwan. We discussed maybe going there for a weekend or to Jeju which is an island off the coast of Busan, South Korea. That evening I started searching for tickets to Jeju, Japan and Taiwan. About a week after we booked our tickets (Kate, Rucy and I), my brother told me he was coming to Korea and that his visit here would overlap with our Japan trip: three became four. Our flight was at 10.25 from Seoul Incheon airport, hence the early start and we arrived in Osaka a little after noon. It took a little while to get to Osaka itself as we grabbed convenience store food and then, inadvertently, stood in the wrong line for a good 30-45 minutes before Rucy figured out our mistake and went to check if we could take a different train. The train journey itself was smooth and uneventful - except that during it, Rucy managed to perfect the Korean technique of falling asleep and only waking just as they announce your arrival at your station. When I take subway or train naps, I knock out! If it wasn't for my alarm, I would find myself in Busan on many occasions! 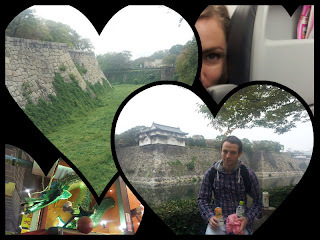 After dropping our stuff at the hostel and discovering nearly everything we wanted to do that day closed at 4, we proceeded to the Ebisucho subway area to see the Tsūtenkaku tower. Initially impressive looking, the tower itself was a bit disappointing. We found ourselves underneath a quite diminutive tower with a 45 minute wait. 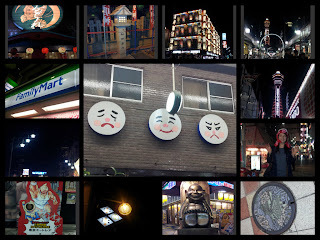 However, the street from the subway station to the tower was lit up and filled with interesting shops. 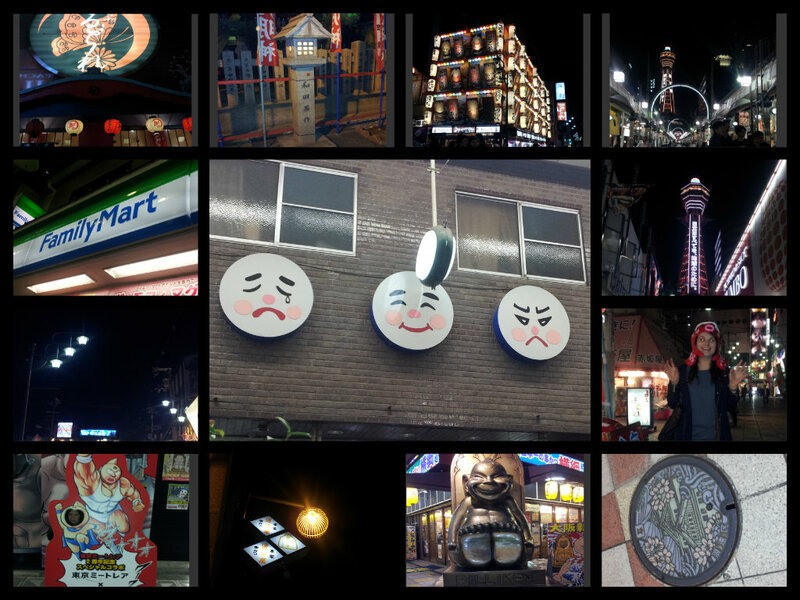 So instead, we wandered around the area taking in the lights, colours and smells of Osaka. 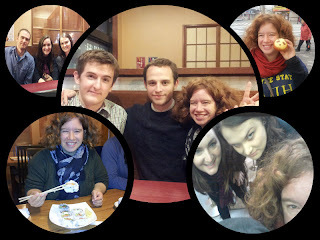 Sadly, this was quickly done and we found ourselves at a lost of what do do until 8 when we were meeting our friends who lived in Osaka. During our wait, we discovered one big difference between Japan and Korea: WIFI. I never realised just how prevalent it is and how much I appreciate it when I am in Korea until we had no access in Japan and couldn't change our meeting place or times. I don't mind not having WIFI but when you expect it, it is definitely a bummer to not have it! On meeting our friends, we proceeded to our second tourist spot of the evening: Dotonbori. This place was light filled, hip and a clash of Western and Japanese stores. There were plenty of places to eat and tons of things to look at - from cosplay girls to interesting shops and fascinating buildings. 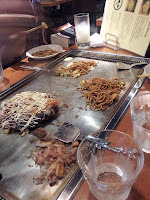 We visited the iconic billboard and ate Okonomiyaki, Osaka's best known dish. 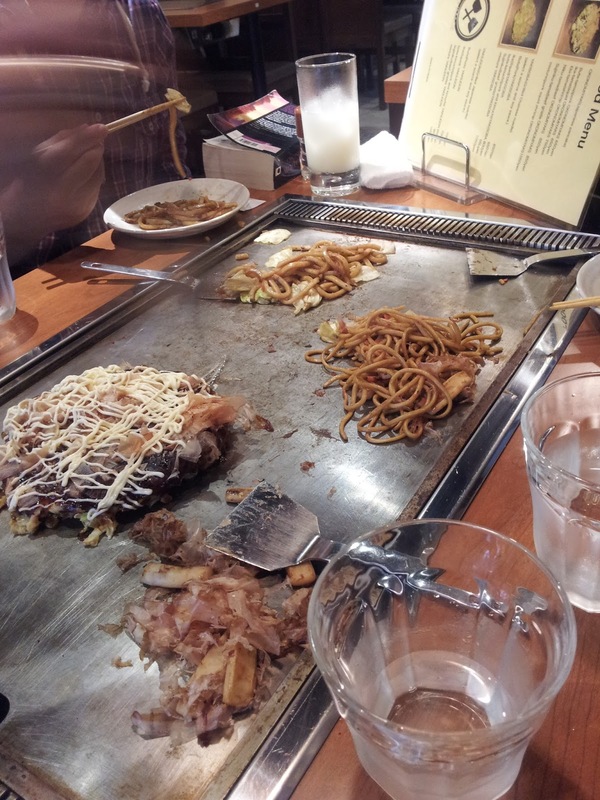 It is cooked on a grill in the middle of the table. However, unlike Korean grills it is one flat sheet. It reminded me more of the Mongolian Grill I went to in Council Bluffs many years ago. This dish is considered a Japanese pancake. Like Kimchijeon, it is a savoury pancake and it very tasty. This is the third Asian country I have been where they have a food that is like a savoury pancake but that has it's own unique twist (Vietnamese Banh Xeo). 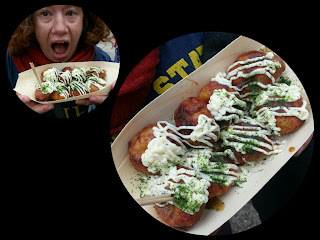 Takoyaki - Photo courtesy of Katetastic. See below for link to her blog*. 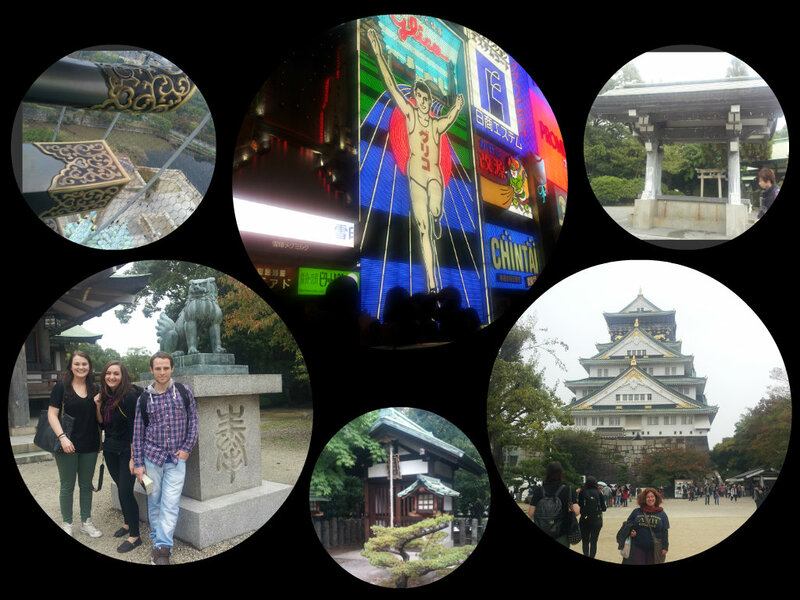 The most impressive sight that we saw was Osaka castle. The grounds were spectacular and even from outside the castle it made for interesting viewing with its deep moat and high, unscalable walls. It reminded me of the view of Edinburgh Castle when it is viewed from Prince's street! When we were there two guys came over to invite us to some show that they were doing that night. 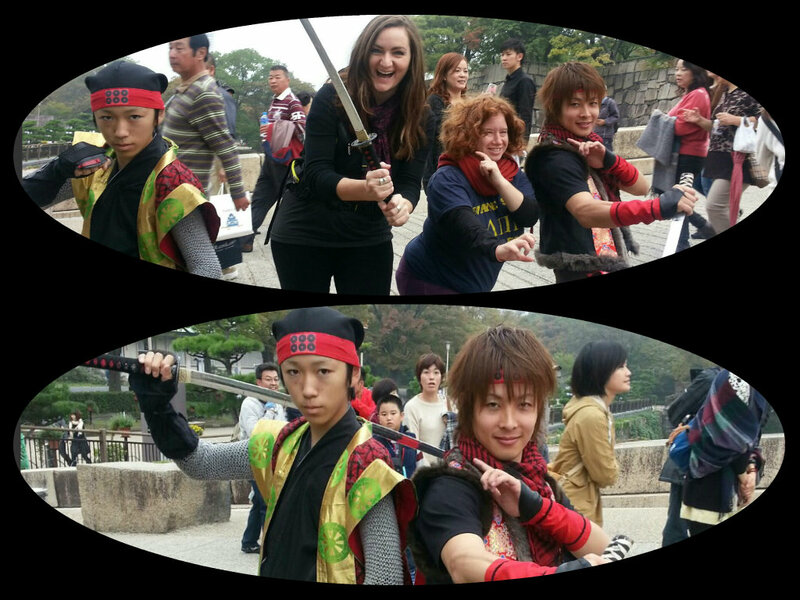 We weren't able to go but we got a photo with them nevertheless. While I found the exhibition in the castle a little disappointing (I think I was expecting what you'd see in Edinburgh Castle! ), it was still interesting and the grounds more than made up for it, especially since we got to try Takoyaki - which again was popularised in Osaka. So, you might think I'm mad to go to Japan for one night. You might think I'm mad to eat octopus considering I really don't like seafood and you might think I'm mad to consider going on another weekend trip. Well, I kind of think that I am mad too! I am exhausted. I don't think I've been so tired in an age. However, I also know that my lack of recovery from this trip is not really due to having gone to Japan but having had to get up really early and having had some sort of Saturday school every weekend for the last few weeks and next coming weeks. That is what tires me out and makes me non-functional for a week! Or at least that's what I prefer to believe - the other option is that I am getting old and travel tires me out. NEVER! PS. 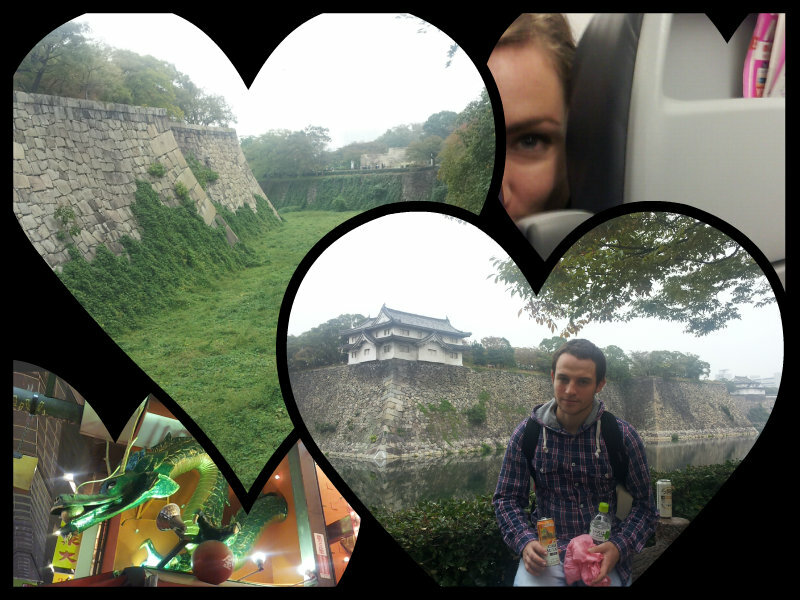 This post was inspired by my trip to Japan and by Beyonce's If I were a boy. PPS: Katetastic's blog can be found here. It's a fantastic one, so read away! Thanks, Kate for letting me use your pictures! Awesome Maggie, this looks like you guys had so much fun! I'm glad you got to see Conner :) Miss you! Thanks, Bets! 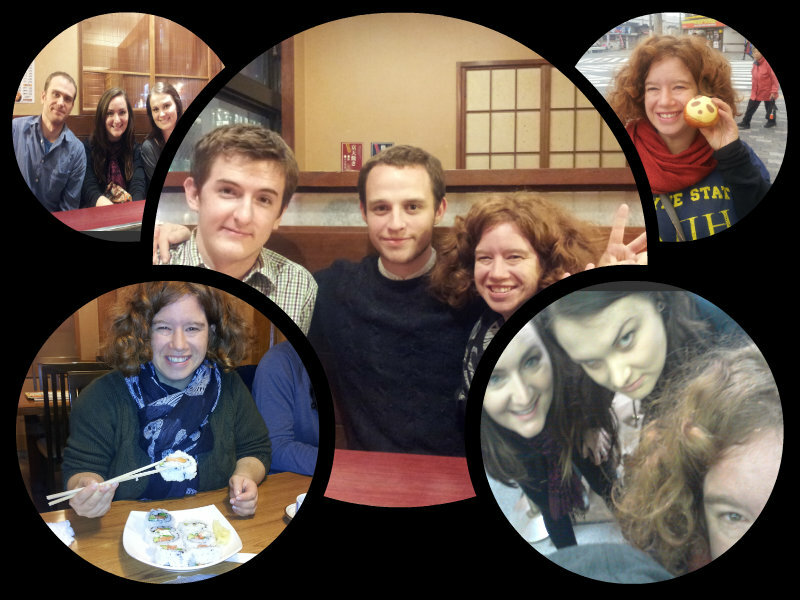 It was a total blast and it was great seeing Conor! Hope to see you soon! Muuah! Miss you tons!